BloomBoard is pleased to announce that in partnership with Digital Promise, a number of new micro-credentials are available in our ever-growing micro-credentials library. Micro-credentials–bite-sized demonstrations of competence for specific skills–have been gaining popularity for their ability to acknowledge an educator’s pursuit and recognition of learning, both formal and informal. At the end of May, I visited with a teacher friend of mine at a local elementary school. After the usual discussion of the frantic end-of-school-year pace, she talked about some of her students. She’d had a very challenging year, a class full of students with a very wide range of learning needs. She worried that her students would “backtrack” a good deal over the summer. One way for students to continue learning over the summer is through technology, but this time is often unsupervised and lacking specific learning goals. With the start of a new school year just around the bend, it's the perfect opportunity to get students back in the groove of learning and also remind them how to use digital tools responsibly and in a targeted way to support their learning. I suggested to my friend that she look at the collections on BloomBoard, and use them as a model for creating collections for her own students as they head back to the classroom this year. 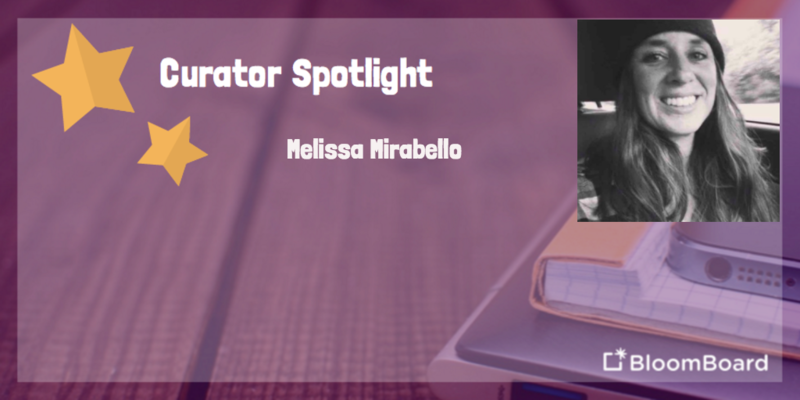 Melissa Mirabello is a high school English teacher with over twenty years of experience teaching students of all different levels. When she's not bringing her boundless energy and enthusiasm to the classroom, she builds collections of teaching ideas and resources on BloomBoard, covering broad topics like establishing classroom norms and voice in writing, and specific books like The Catcher in the Rye and The Stranger. We chatted with Megan about using hooks and warm-up activities to set the stage for class, the teachers that made her want to become a teacher, and her goal this year to narrow the achievement gap for her minority students.